Finding rest for our souls sounds like such a wonderful thing! Yet few of us ever find it because we don’t understand the purpose of the yoke Jesus refers to. We read the verses and our minds stop comprehending the words at the thoughts of “rest for your souls”, and overlook what Jesus tells us to learn from Him. In Matthew 11 Jesus has just pronounced “woes” to those cities in which He had ministered and showed greater and wondrous works, yet they did not believe. He told them that it would be more tolerable for sin-ridden Sodom in the Day of Judgment than Capernaum. He said that if the works He had done in Chorazin and Bethsaida had been done in Tyre and Sidon, they would not only have repented – but done so with great grief for their sins, in sackcloth and ashes. He even says that Capernaum would be brought down to hades, because if the same things that he had shown in Capernaum had been done in Sodom, Sodom would have remained a city and never been destroyed. The sum of the woes He pronounces was this: To those who have seen His works and denied Him, there is a greater judgment. Through their unbelief and desire to continue living in sin, they denied Jesus the right to lead them. In business, family, finances, education, or any pursuit it is important that if you have a leader, the leaders knows how to lead you. They must know the best way to accomplish your goal, and the proper steps to get you there. And when you find a leader that can truly lead you to your goals you do what they say – without question and doubt. Jesus continues in Matthew 11:28-30 speaking of His leadership. He says “Come to Me, all you who labor and are heavy laden, and I will give you rest. Take My yoke upon you and learn from Me, for I am gentle and lowly in heart, and you will find rest for your souls. For My yoke is easy and My burden is light.” He is speaking to those that labor for what He offers – the release of the guilt of sin, and the power of sin in their lives. This is what He had offered to Capernaum, Bethsaida, and Chorazin. Jesus asked them to “Take my yoke upon you and learn from me, for I am gentle and lowly in heart”. To learn from Jesus gentleness, which in some translations is called meekness, and lowliness of heart is to learn to be submissive and allow yourself to be led. In John 5:19 Jesus tells of His own submission to God, saying “the Son can do nothing of Himself, but what He sees the Father do; for whatever He does, the Son also does in like manner.” He allowed God to lead Him, and was submissive to Him even to the cross, praying in the garden before His betrayal, “nevertheless not My will, but Yours, be done”(Luke 22:42). 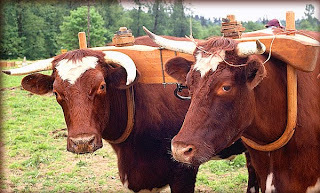 A yoke is a wooden crosspiece that is bound around the necks of cattle with a wooden “U” shaped bow that keeps them connected to the crosspiece. In the center of the yoke is a swivel with a guide that can be attached to a wagon or plow, whereby the cattle can be guided to work for the leader. Salvation removes the guilt of sin, through justification. But release from the power of sin over you will only occur when you allow Jesus to lead you. We all have those sins we continually come back to and cannot seem to shake free. For some of us, they are our “pet sins” and we just love them too much to give it up. For others, it’s a matter of weakness, a lack of self-control that causes us to continually fight those sins. But until we come under the yoke of Jesus Christ, and allow Him to begin the sanctification process, we are in a struggle, a constant battle of flesh against Spirit. There is no rest for our souls. What Jesus is offering is rest, an end to the struggle, peace and completeness. He offers completeness to His plan for your life. Do you want success in this life? There is only one way to measure success and that is in its eternal weight. Earn millions here on earth? Wonderful! But you won’t take a dime to Heaven. Gain fame and respect here on earth? Lovely! What fame and respect do you have in Heaven? If you’re going to live their eternally, and I pray that you are, then you should be looking for success in eternal weight, the things in which God finds valuable. Allowing Him to lead you will ensure that you operate through God’s plan for your life. In that plan, and only in that plan, is true success found. Read that last part of the passage again. Jesus says “For My yoke is easy and My burden is light.” There is a misconception that working for Christ is a struggle. But in all truth, it is far easier to walk through life in the way Jesus leads than to try to create your own path. He is a strong leader, with your best interest in mind. He is being led by God, who has seen the beginning, and the end, and knows what lies ahead. Not even the best financial advisor in the world can offer you that kind of guarantee of success! Take His yoke upon you. Come under His leadership in full submission, praying for strength from Him and leadership. Then you will find sweet rest and peace for your soul.